Over the past year, we've taken our commitment to clean living to the next level-- by overhauling all of the toxic products we possibly can in our home. Because, if we're going to put so much effort into putting all of the best foods inside of our bodies... then why cover the outside with toxic lotions & potions? And how can we then be comfortable inhaling the suspicious chemical cocktails in cleaning products, laundry soaps, dryer sheets, and candles? It's caused a huge shift in my thinking, and has definitely made me take a second look at all of the advertisement we are constantly being faced with: pushing so many products that we not only don't need, but are actually harmful to us. I've invested in some clean, all-natural household products that we can make use of in so many different ways, and can't believe the money it's saved us. We're also left with fresher-smelling surfaces, much more cabinet space, and far fewer headaches. In other words, we're never going back. 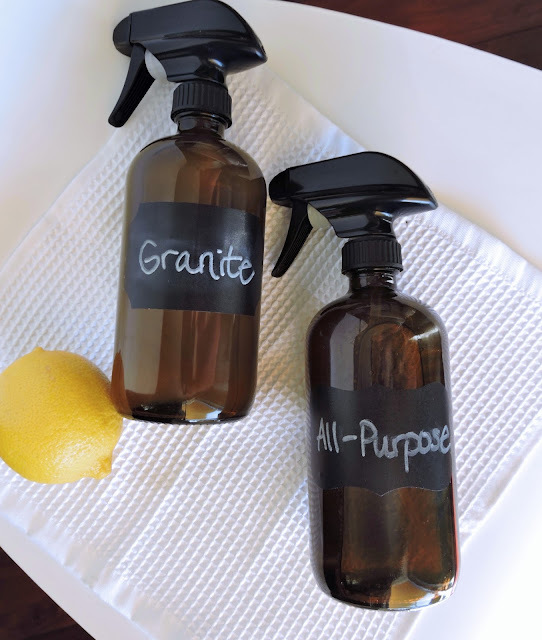 To start, I thought I would share my two favorite homemade cleaners. Because between these two, I can clean everything: hardwood floors, granite counter tops, toilet bowls, windows... Even our iPhones are germ- and streak-free. And when the bottles get low, I simply refill! No Target trip necessary. They smell amazing, are ultra-safe, and make me want to clean my house. Have I convinced you yet!? :) So here are my simple DIY "recipes" if you'd like to give them a try. Links included to all of the products I use! I use my "All-Purpose" cleaner on surfaces that would typically call for a "disinfectant". The star of this spray is doTERRA On Guard~ which is one of their essential oil blends. The fragrance is like a spicy, cinnamon-citrus: super fresh & clean. The blend is known for its immune support, and makes a super effective surface cleaner when combined with the acidity of white vinegar. Perfect for bathrooms, tile countertops, windows, and electronics (just spray on a cloth first). *Toilet bowl tip: sprinkle baking soda around the edges of the water, then spray with your All-Purpose cleaner. Watch it bubble, then give it a quick scrub! 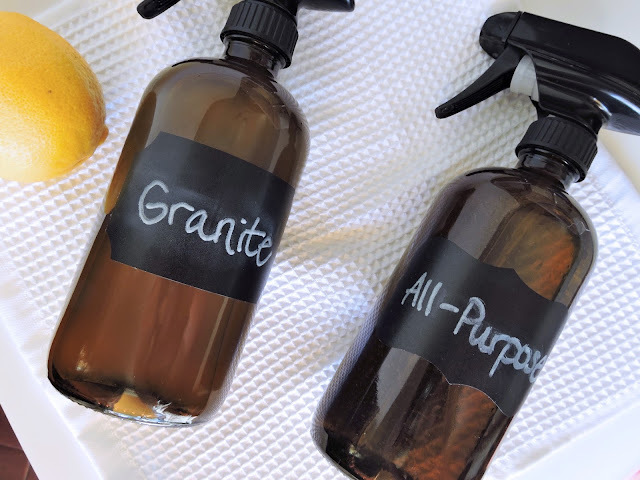 This is a vinegar-free formula that's safe enough for granite, marble, and stone. 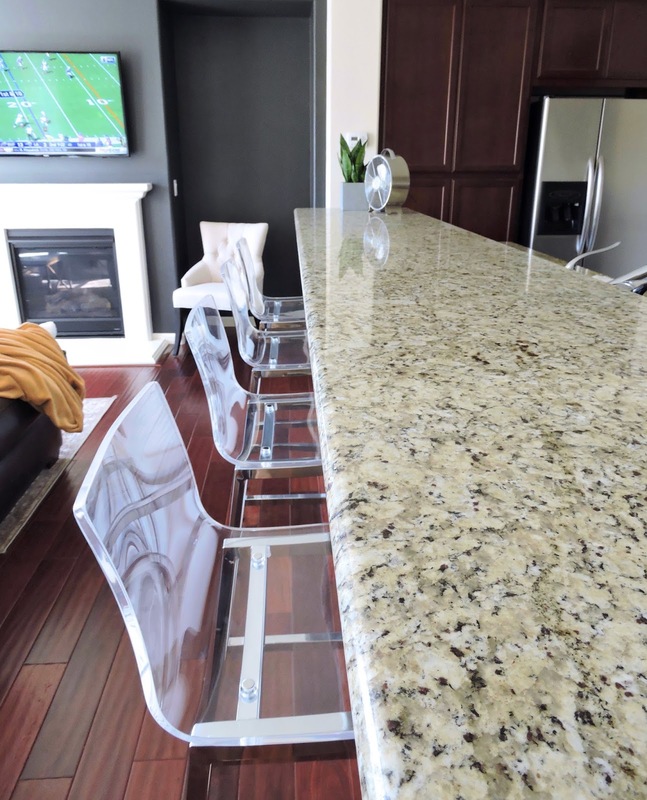 It cleans & freshens without dulling or etching the finish of your countertops and tiles. I use this for our granite countertops, and also on our hardwood floors. The lemon adds just enough acidity to clean, but is balanced well by the gentle castile soap. It adds a super fresh scent that's perfect for the kitchen! I also use this to get any fingerprints off of our acrylic barstools. Thanks for the tips, I will be making these for sure. This is my go to, cleans everything, especially tough stains like in the oven, just put some on let it sit and it will come right off! One cup baking soda, one tablespoon Dawn dishsoap add water slowly to make a paste. Nicks’s Window cleaning Service provides residential and commercial window cleaning, or gutter cleaning for your home and office needs. If you have inquiries, don't forget to contact our customer support. DIY oil surface cleaner is suitable for our home. Thanks for sharing. Thank you for sharing, I just wonder if it is possible to remove the grease on counter top too? Or do we have to use some kind of e enzyme cleaners or else? Do you have any tips for hard water build-up and soap scum in the shower?